excellent questions with excellent information. Outcome PASS the test. Some material needs discussion or evaluation based on your experiences. I felt this course has definitely given me a better understanding, from an Emergency Management perspective, of how information is gathered and passed on weather occurences and how I can access and use that information to be better prepared. This is a well organized lesson that contains useful information that is presented in a logical manner that keeps your interest. Super easy, Best to be understood. I enjoyed this online course. It was easy to use and I could leave it and pick back up on it at any time. I appreciate the opportunity presented here. Safety information regarding weather and like situations will definitely be apart of my family plan. Fantastic course, loved every minute of it. I took this test for my company, a private security firm, it was very educational. C'est une belle leçon qui te fait apprendre de nouvelles choses. Le seul bémol que je mets est sa durée. Surtout que l'anglais n'est pas ma première langue, elle m'a pris du temps. Ma proposition est de la séparer pour en faire deux leçons de 4 et 5 heures par exemple. Ce serait plus facile de l'apprendre ainsi je pense. Merci. Good information. Will recommend others to take this course. A very long but informative course, very helpful. this lesson is very helpful to get a better understanding of weather hazards and weather itself! I have printed the modules. There are sections I want to review for future use. Great information! Presented and well and great format. I would have liked videos. Extensive material to learn, but all relevant. I thoroughly enjoyed this course. It contains a lot of information on all forms of weather hazards, however it focuses more on floods. Take notes on important material. Not your typical "on-line class". It was current, informative and not boring. I feel like I can now be the neighborhood watch dog for weather. Based on my experience, I believe this training is a little too detail oriented for first responders. I do appreciate the opportunity to review it for future use in my career. very well done, concise, and informative presentation on all things weather. As an emergency manager I will use the information immediately to better under the weather events that could impact my areas. I have never learned so much valuable material in Meteorology. I am a lay person, who has a vested interest in severe weather. I found out about this course through SKYWARN Forum and so glad I took it. very good and educational. perfect for weather enthusiasts and the public alike it was challenging but it makes you think and can prepare you for any hazardous weather that may come your way. An interesting and useful course. I especially liked the exercise at the end. The lessons were well organized and interesting. More interactive learning and more real life examples. Ways to test knowledge other than questions. Good program. This program was helpful in deciphering the elements published by the NWS. This educational program provided some great interactive training on the importance of close communications and interactions with the NWS. There was great information included to allow an emergency manager to work on a weather hazard analysis with excellent information regarding references to assist in data collection. 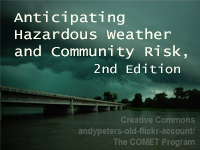 The weather-based educational material made available on MetEd, "Anticipating Hazardous Weather and Community Risk" provides quality training that is exteremely useful for evaluating and preparing for threats from a wide range of weather from natural hazards to preparedness. The program is highly recommended for the beginner and is great refresher for those in the meteorolgy profession and Emergency Management.